I thought I'd drop you a line to let you know what happened in our class yesterday. We spent a lot of the afternoon learning our 7 & then 9 times tables. We used your method for learning the tables & the kids really enjoyed it (once again!). We had spent about 20 minutes learning them & then I used the Uno cards. The kids really enjoyed using them. One of my 'learning challenged' kids wanted to have a go at the cards & she did the whole pack to the utter amazement of the rest of the class! The last card was a 3 & when she answered it correctly the whole class cheered & clapped and she had tears in her eyes because she couldn't do it before. What a buzz! I wish you were there to see it! A parent came in to see me after school to say that she had cut out an article about you & had it on her fridge! She was thrilled to hear that I was using your system in my class & thought it was great. Her daughter had been practising at home & had taught her 5 year old sister the 2 times table! I hope you give yourself a pat on the back because all this success is because of you! 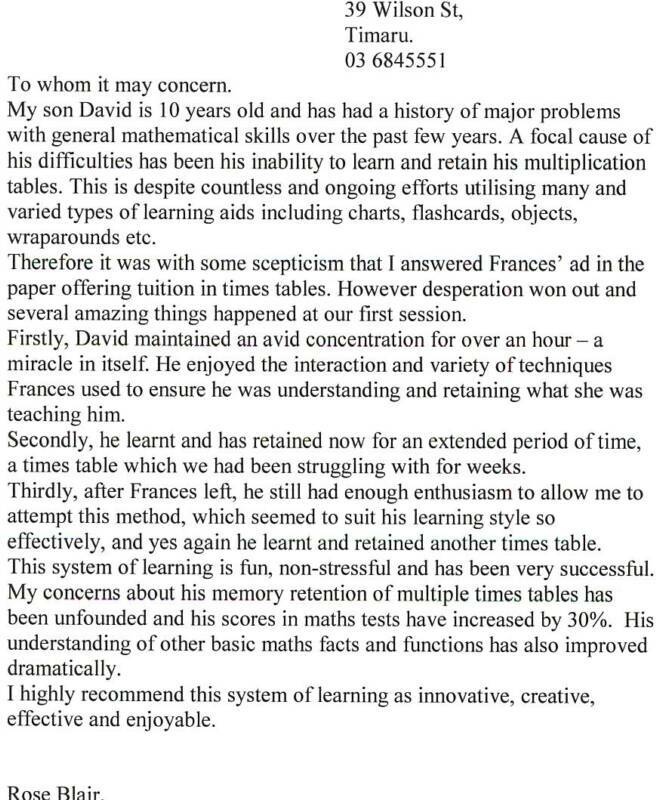 Frances was then contacted by Mark Price of TV3 news, who asked all the relevant questions and made arrangements for a demonstration at a local vineyard cafe for two students who had no experience or knowledge of Frances' learning system for math. As Frances began her teaching, Mark asked, “How long will it take to teach these two to learn the seventeen times table?” Frances answered ten minutes, and he set his watch. Exactly ten minutes later and lots of filming the girls from differing angles, they now had to answer and they did without a mistake. And in front of everyone at the café and the camera. After the film featured on TV 3 News, Frances was approached by Rowan Taylor from the New Zealand Listener. This time Rowan’s 6 year-old son Caidan, was to be the test to see if this system really worked. Rowan also bought along his brother, David, a school principal (Ashley Primary) to further verify the results. It wasn’t long before Caidan knew his four times tables, much to the astonishment of both skeptical men. Then another two resourceful schools joined forces to see for themselves this teaching in action. The two schools were really impressed and Frances was featured on the front page of The Marlborough Express with an autistic child who learnt his 4 times table. The Timaru Herald and several other newspapers. Please refer to the Letters of Appreciation and Media Stories for more proof! Thank you for all the effort you put in teaches us all! to teach in a new and different way ! Your finger tactics can be adapted for almost anything! Please know that it is really appreciated. Thank you to all the hundreds of parents, children and teachers who have sent me letters, cards and best wishes after learning Fingerithmatic, Qwertyqwik, Spell Quick and Telling the Time on Your Hands. Knowing I have made a difference in your lives is very satisfying to me. I hope that you continue always to make use of the memory that is hidden in your fingers! Please accept this as a personal acknowledgement of my appreciation of your interest in my system and your support of me. When it was my turn to go through the staffroom door, Mrs More said “Come in Vernon and Clinton, take a seat.” Mrs More knew me well. My Mum had taken me to Mrs More. Mrs More had two houses. She had two turtles, a wallaby and also some fish. The wallaby was grey his name was Ozzie. Mrs More was skinny and also quite tall. Then after, Mrs More came to the hall and taught us the 17 times tables. First I thought ‘no way’ and then when she said she was also going to do the 999 times tables I thought I must be in a dream. I felt silly. Then when it worked I didn’t feel silly any more. We had supper there was chocolate cake, biscuits and banana cake. They were delicious. Mrs More came into our classroom to get Sisi, Todd, Julius and me. She did the very good two times tables and Todd and I were so good at the two times tables. Then she went into the three times tables and it went like up to thirty. I felt so excited about knowing all of the two times tables. I was so nervous about it at first because I didn’t know my two times tables, it was so freaky. I was so pleased at the moment that I nearly fell off my seat. I wandered into the classroom where a tall thin lady with brownish hair sat. She was called Mrs More the fingerithmatic lady from Timaru. My teacher Mr Rivett and Mrs More were chatting about something, but I wasn’t sure what. I felt so nervous that my knees were shaking so hard I could cause the next earthquake. My gut was so tight and well… I had a feeling that was going to cause the next earthquake. Suddenly I froze “Come and sit down,” said my teacher, pointing to a blue chair that was sitting in between Mr Rivett and I sat down. I was shaking worse than ever. “Okay Sarah, what times tables are we learning today?” Mrs More asked kindly. “Ummm,” I thought that I never really learned my eight times table, so I replied “eights.” “Okay she said smiling. I knew this was going to be harder than I thought we were going to play a game of cards. Mrs More magically pulled out of the deck and placed it on an elephant. “Before we do this let’s give our fingers their numbers.” She told me, holding my hands. When she had finished she placed cards on the elephant like eight, I replied “64” smiling happily, we did it until we ran out of cards. “Wow!” I said with a big smile on my face. Lets do some long division,” she said. On a blank piece of paper she wrote 931468297 divided by eight. “Now find the answer,” so I did. Man this is easy I thought happily. I ran back into the senior room thinking how easy it was. So we were doing our work when somebody arrived. It was the person who takes us for maths. She asked us who wanted to learn the two times table. Mr Rivett told Brendon, Sisi, Julius and me to go to the staff room with Mrs More, she was teaching us something about numbers. Mrs More told us to hold out our hands and she numbered our fingers one to ten……She asked me if I knew them and I said “Yes” and then she asked me 3 times 8 and I said “24” and I knew them. Wow! “This is so simple,” I said to Mrs More. I know my 17 times table. I felt like a genius. All I had to do was talk to my fingers. I got it in my head in 5 minutes. I had a big grin on my face and I thought to myself that was fun. Luke had a good time too because he had a big smile on his face, I felt happy for him. We then played a times table game with Uno cards. Man this is easy I thought to myself. I was in the staff room at school learning the 3 times table with Mrs More and Sam. We then went through a pack of Uno cards to practice. Wow! How easy. I’d just learned my 6 times table in order and now I am skipping onto the seven times table. On Wednesday March 10 after school we went in the car to the Morven Hall to learn our times tables. My hand was shaking because I haven’t learnt times tables before. Mrs More was going fast. Mrs More called out “what is four plus one?” I put up my hand and Mrs More said “What is the answer?” I said “5”. Mrs More said “Its right,” I felt very proud of myself. I went with my dorky brother and my Mum. I went in the star wagon. Holy cow, it was easy! I learnt the 17 times table so quickly I thought. My Mum thought wow! This is fun. Mrs More told us about the highest mountains in New Zealand. She said them so quickly, she even said the longest rivers in the World. 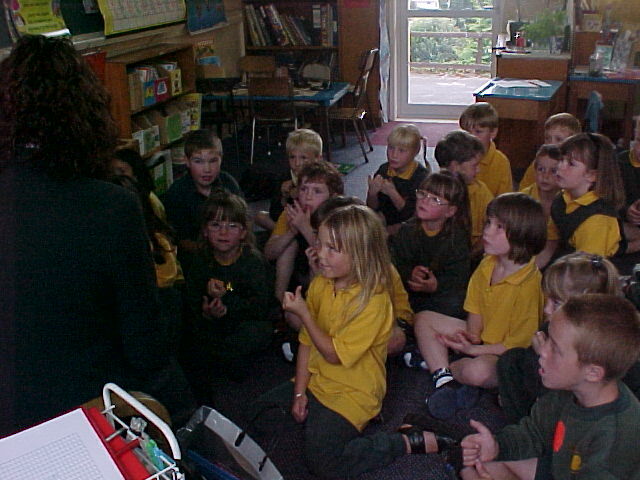 We all learnt percentages on our fingers. Morven School had a very successful time with Frances More. The children loved the way it helped them with their tables and the parents were just as impressed when Frances taught them the 17 times tables that night at the Morven Hall. Thank you for teaching me the maths. It made it easier for me to understand my maths. I have been practising each day and at school. Rebecca likes it too. From Daniel Allnutt. (10 years) NZ. The children loved you as a teacher. Thank you for sharing your "hands" with us all. I am sorry this card will come to you weeks after you were at Seddon. It will take a wee while to collect all published work. Please call in and see us again. Remind us of the 'wiggles'. All the best with your career Frances. I've only been teaching 7 years! Training college for me at the grand old age of 38! I gave Mike what I hoped were sensible, positive, helpful comments for your up and coming brochure. I appreciated very much the time you spent with us and this method of teaching tables has a 'real' place in teacher's repertoire - or 'tool box'. I have truly enjoyed having the opportunity to meet you and share your enthusiasm about your awesome programme Fingerithmatic. The potential of your programme is outstanding. The bonus to learn about touch typing and spelling is just that a bonus. Your delivery of the programme was exceptional, dealing with educators who had been deprived of the sun for so many weeks. I am truly interested in helping you develop your programme further, I look forward to hearing from you in the future. Once again thank you for the opportunity. ....Every time I'm on the computer, I think to myself - use your fingers - not your eyes. I still need to learn a lot, but I really enjoyed your classes. Neither of my homeschooled children enjoyed maths, they are very able but had a mindset of not liking maths therefore it’s too hard and ‘boring’. After 90 minutes with Frances they were both fired up about learning their times tables, long multiplication and division. My 9 yr old had learnt his 7 times tables and my 10 yr old her 17 times tables in about 10 minutes. I was stunned. Even I have managed to learn my 13 times tables in a few short minutes. The children have gained a lot of confidence about their ability and that has benefit right across their learning. I fully recommend Fingerithmatic as a great tool to make maths fun and easy for all and to take the stress off the teacher/parent! I can't thank you enough for having us! She is doing well. I am working this weekend although yesterday I made copies of her handprints! We will practice tonight and will learn the 3 time tables! I am amazed how quickly she picked up on the "11" additions! She showed me next morning with little assistance on my part. You bet she's looking forward to seeing you again!